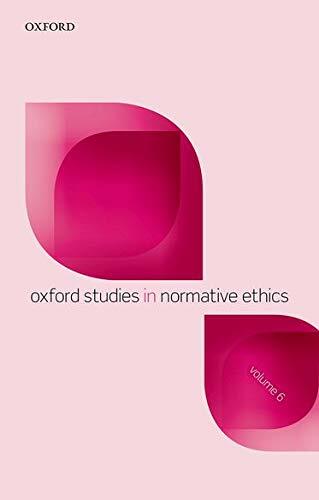 The Oxford Studies in Normative Ethics series evidences the sentiment that normative ethics continues to advance down fascinating new avenues. The latest volume includes twelve papers that comprised the program for the sixth annual Arizona Workshop in Normative Ethics. It broaches a broad range of moral issues from taking pride in being a badass to the question of how we can truly love someone whose practical identity is flawed. Editor Mark Timmons introduces the work with a useful guide that readers can employ to choose the essays they wish to read. Like selecting from a variety box of chocolates, the reader can decide to devour those chapters that suit their philosophical palate. I will offer a brief description of each paper to illustrate the selection of cutting-edge debates the collection displays. Stephen Darwall's 'Taking Account of Character and Being an Accountable Person' harks back to the Aristotelian question of if and how we are responsible for our moral characters. Darwall proposes that we are at least partially accountable for our moral characters. Using the Strawsonian distinction between deontic assessment (responsibility as accountability) and aretaic assessment (responsibility as attributability), Darwall proposes that although the main focus of accountability in normative ethics is intentional action, agents are nevertheless responsible for their moral character. He concludes that 'we are accountable for being accountable persons, for being disposed to hold ourselves accountable to others by placing ourselves in relations of mutual accountability with them' (34). Darwall addresses the obvious challenge of whether a moral agent is always able to recognize and evaluate their moral character and claims that it is 'once we become aware of [our moral traits] and can do something about them, we become answerable to them too' (31). This raises the questions of what sort of cognitive factors must be in play for a moral agent to be truly aware of their character and what conditions must pertain for us to deem that they can be changed. Darwall's conclusion also invites discussion on whether others are obligated to inform a moral agent of their moral character if they are blind to it. Do we have a moral duty to point out character flaws to help further accountability? Serious character flaws are the focus of the second chapter of the publication. Claudia Card's 'Taking Pride in Being Bad' offers a unique insight into the question of how something can be valued in virtue of its 'badness' or, as she phrases it, 'taking pride in being downright evil' (38). Card explores the Kantian distinction between radical evil and diabolical evil and Kant's denial that evil is ever committed for evil's sake, before launching into an exposition that attempts to 'make sense of the idea of valuing something in virtue of its badness, not merely as a means to an independently conceived further good' (38). Card constructs an account of evil that 'preserves responsibility in most of us…yet dissipates…the mystery of why some of us become good and others evil' (45). She establishes what she terms 'the atrocity paradigm' – an alternate theory of radical evil formulated to account for individuals who act 'under the guise of the bad' (46). Arising from this theory comes what Card calls 'Kant's Mystery': if cruelty is pleasurable to some, then how can evil never be committed for evil's sake? She attempts to solve the problem using Christine Korsgaard's claim of 'self-conception as a source of normativity' (which advocates a broader view of self-conception than the Kantian model) and Lorna Smith Benjamin's notion of 'important persons and their internalized models' (the view that attachment to a role model can be a catalyst for bad behavior). Card questions whether internalizing an evil role model constitutes being truly immoral and concludes that it does. By adopting this approach, she is stressing that acting in the guise of being bad is (in reality) acting under influence of an internalized bad influence. Although Card's engaging contribution provides an interesting explanation of how someone can value something for its badness, her reliance on attachment theory will be challenged by those who reject an explanation of evil behavior solely reliant on psychological attachment theory. Character is again a key theme in chapter three. Kate Abramson's paper, 'Character as a Mode of Evaluation', questions the distinctions we make when we define personal attributes. Some are judged to be handicaps, others abilities, others virtues, and others vices, among other things. Abramson aims to explore these judgements and their underlying motivations. Suggesting that contemporary ethicists mistakenly assume that different attributes equate to different qualities, Abramson takes a different tack. She suggests that the key difference between the attributes lie in the modes of evaluation we adopt to make these judgements. Further, she claims that the process of deciding on a method of evaluation is an ethical decision itself. Abramson uses the analogy of computer software to illustrate how different individuals evaluate systems in different ways: a programmer judges the software aesthetically, a user practically. Similarly, when we judge personal attributes we use different modes of evaluation: the natural ability mode, the medical mode, and the moral mode. Which mode we adopt is dependent on three categories of consideration: 1) psychological facts about the modes and those choosing the modes 2) the interpersonal factor of selecting a particular mode in a particular situation, and 3) the 'comparative appropriateness' of choosing one mode over another. As to whether Abramson definitively proves that the three suggested modes and categories of consideration comprise an accurate and exhaustive list I am unsure, but her paper certainly emphasizes the importance of exploring the categorization of personal attributes and the motivations that lie behind the process. In his paper, 'The Normative Force of Promising', Jack Woods examines why promising to do a certain action entails a reason to do said action. He dismisses several prominent theories before proceeding to outline his own 'more plausible' (77), quasi-conventionalist explanation. Drawing on the classic promise-examples of the Deathbed Promise, No Expectation Promise, and Conflicting Promises, Woods clearly emphasizes the flaws apparent in other approaches before introducing his own. According to Woods, the reason why promises give reason for action is because breaking a promise implies a 'liability to blame' that we wish to evade. Woods believes that blame-liability is 'exactly the sort of property we need to explain the normativity of promising' (91) because it is present in every single case of promising. Woods has made great headway in the debate surrounding the motivational force of promising, but I wonder whether every promise-example really does include blame-liability. What about a promise made to oneself? Or a promise that the promisee takes more seriously than the promiser? Exploring a few more counterexamples in depth might help strengthen the argument even further. Also spotlighting the nature of promises, Hallie Liberto's 'Promissory Obligation: Against a Unified Account' advocates the unusual view that an account of promissory obligation need not be unified. Rather than endorsing the superiority of a single account of promissory obligation, Liberto professes that considering more than one type of promissory obligation is prudent. That is to say, promises do not create just one type of moral obligation. Liberto's approach, therefore, bypasses one common criticism promissory obligation accounts: that there are promise-examples that do not fit with the account being advocated. Liberto outlines the four main models of promissory obligation (the Authority, Expectation Reliance, and Trust models) while simultaneously offering counterexamples of promises that undermine each. Having established that all four accounts are flawed, Liberto details two interesting promise-examples intended to undermine a unified account. As more than one distinct obligation rises from each promise, she argues, there cannot merely be one kind of promissory obligation. Liberto's examples are carefully chosen and her argument persuasive. She concludes, 'so long as the promising act that gives rise to promissory obligation is an interesting feature of human behavior or language, then these obligations, however lacking in unity, can be sensibly examined together' (121). If she is right then, contrary to Woods's earlier contention, it may not matter if one promissory model cannot account for every single promise-example. Susan Wolf's 'Two Concepts of Rule Utilitarianism' aims to resurrect rule utilitarianism by endorsing a new way of thinking about morality. Wolf offers a comprehensive exposition of rule utilitarianism and Smart's forceful objections to it, the most prominent being that rule utilitarianism is unhelpful when dealing with quandary ethics such as the famous Deathbed, Scapegoat, and Organ Transplant examples. Wolf poses the question, 'how can it be rational to argue that the rules are right because they maximize utility while refusing to acknowledge that when one would maximize utility by breaking the rules it is right to break the rules?' (130). To answer this question, she invokes Rawls's distinction between general rules (or "rules of thumb") and practice rules (that partially comprise the practices or customs they relate to). She points us to Rawls's comparison of a card game to the criminal justice system. Both arenas operate with certain rules in place that prohibit those who participate from making utilitarian decisions to keep the systems intact. Just as a game of poker would be ruined by the players making decisions based on utility, so the criminal justice system would be undermined if it consistently followed utilitarian principles. Wolf distinguishes between morality as a point of view and morality as a practice, claiming that most philosophers, including Smart, take the former model for granted, but ignore the latter interpretation – an interpretation that could offer a solution for the rule utilitarian. Although rule utilitarianism cannot be saved by viewing morality as a point of view, Wolf concludes that it can redeem itself by adopting the 'morality as a practice' approach. Although Wolf's approach, if accepted, may not provide rule utilitarianism with a 'get out of jail free' card, it at least provides it with a good lawyer. Drawing on Enlightenment ideas, David Schmidtz's paper 'After Solipsism' uses the distinction between parametric systems and strategic systems to demonstrate that morality is not simply a question of deciding what action to take, but deciding on the strategy you will use in your moral world. Rejecting the notion that our world is a parametric system, Schmidtz accordingly denies the practice of maximal giving proposed by Singer and other utilitarians that states we should sacrifice as much as possible for the greater good. Schmidtz, contrastingly, says that this line of thinking causes a solipsism that ignores the cooperative relationships we forge with others. The moral decisions we make have an effect on (and are affected by) other people, therefore our world should be viewed as a strategic system. More attention should be paid, he claims, to the effects our actions have on the other moral players who engage in the strategic moral game with us. Ultimately, Schmidtz accentuates the significance of strategic deontology and explains why we should view moral theory as a careful deliberation of which strategy to use, rather than a debate purely about right and wrong action. Schmidtz's paper is a refreshing reminder that some of the fundamental assumptions of moral theory can be seriously challenged. Utilitarianism is under fire again in Barry Maguire's 'Extrinsic Value and the Separability of Reasons'. He begins by placing the reader in the position of an act-consequentialist sniper targeting Pelé in the 1966 World Cup. This chapter explores the seeming contradiction between the moral actions rule utilitarianism prima facie leads to and our moral intuitions, which frequently conflict with those actions. Maguire points out that the rule utilitarian is morally obligated to commit morally repugnant actions that maximize value, and he aims to demonstrate the weight of value-based, non-Consequentialist ethical theories to overcome this contradiction. Maguire starts with the assumption that the reaction of sadness (in this case, the millions of people who would be saddened by Pelé's death) is somehow valuable. He states, 'it is natural to think that there is something valuable about such grief in the face of such a tragedy' (166). Cases such as these, which include some sort of 'non-instrumental extrinsic value', create a puzzle, which Maguire attempts to solve by reconciling the value-based aspect of consequentialism with these problematic examples. Although the paper contained engaging examples and stimulating ideas, readers may have found it helpful to have clearer outline of Maguire's intentions nearer the beginning of the chapter. Kenneth Walden's 'The Relativity of Ethical Explanation' proposes that ethical explanations are relative and contrastive. Walden notes that ethical theory is not only about moral verdicts but also an explanation as to why those verdicts are true. He aims to answer the questions 'what is it to explain an ethical fact?' and 'how should ethical theorists go about constructing these explanations?' (189) by utilizing the concept of 'contrast space'. When examining the relationship between a fact and the explanation of a fact, Walden claims that we should consider not only the 'two-place relation' between theory and fact, but also include in the equation a contrast space; a three-place relationship that can be applied to moral facts too. If this is the case, then 'the relation of being an adequate explanation of an ethical fact is not a two-place relation between a theory and a fact, but a three-place relation between a theory, a fact, and a space of contrasts' (191). Once multiple examples have been provided, the notion of a concept space becomes more transparent, but a clear definition of the term would help the reader grasp Walden's argument more easily. In chapter ten, 'Two Senses of Moral Verdict and Moral Overridingness', Paul Hurley defends the claim that ethicists participating in the moral overridingness debate focus too much on one sense of moral verdict, while neglecting the other. Hurley distinguishes between two discrete senses of moral verdict and moral overridingness: the first sense views moral verdicts as reflections of decisive reasons for acting from a 'distinctively moral standpoint, viewpoint, or point of view' (216), which Hurley calls the moral standpoint sense. The second sense views moral verdicts as reflections of 'decisive reasons simpliciter for acting that are in some sense distinctively moral' (217), which Hurley calls this the rational standpoint sense. Hurley is quick to note that the two senses are 'not rival and mutually exclusive' (139) and if we are to engage in fruitful discussions of moral verdicts, both should be invoked. The distinction Hurley makes is an important one, but readers who are not experts in moral overridingness might have benefitted from more examples and further clarification of the difference between the two senses. Erich Hatala Matthes's 'Love in Spite of' offers an interesting perspective on the nature of love and of what it really means to love someone. Matthes wishes to consider the question of how love relates to the bad (but significant) qualities people undoubtedly possess. Setting aside the metaphysical question of personal identity, he argues that we love someone not as a sum of their parts, but for their positive qualities, and despite their negative ones. Matthes concludes that in all cases of love (and for all types of love), we love someone in spite of their bad attributes. He draws on the work of Julia Markovits to claim that 'an action is only morally worthy if it is performed for the right reasons' (248) and to construct an identity requirement for love: 'A person P loves S if and only if-and to the degree that-S's practical identity is among the reasons P loves S. The model seems to view bad qualities as cumulative reasons not to love someone, and several questions come to mind in response: does love become increasingly less complete the more bad traits a person acquires? Is the love judgement completely subjective, or are there certain traits that are likely to lesson love more than others? It would be interesting to hear Matthes's thoughts on these issues. The volume culminates with Gilbert Harman's concise and easy to digest paper, 'Moral Reasoning', which discusses the nature of moral reasoning itself. Harman addresses divers connecting moral issues in a laconic style devoid of bombast. First, he identifies several distinctions between types of reasoning: reasoning with others vs reasoning individually and practical vs theoretical reasoning, as well as the different reasoning processes (rapid unconscious reasoning vs conscious reasoning). Harman is primarily concerned with reasoning that can change previously-held beliefs, or, as he puts it, 'reasoned change in view' (265). He is keen to 'distinguish abstract arguments of the sort studied in logic and mathematics from activities of reasoning and inference' (269), although he notes that one can have an effect on the other. Overall, Harman proposes that moral reasoning might be most prudently viewed as 'attempting to satisfy a variety of constraints like conservatism and coherence' (276) and morality itself might be 'the result of implicit bargaining among people with different powers and resources' (276). Harman packs a large number of thoughts into a short chapter, and there is certainly a lot more to say about the claims he makes; it will leave you wanting more. This volume is a treasure chest of pioneering, thought-provoking, and well-put together papers that demonstrate that the realm of normative ethics is anything but stagnant. It may even prompt the reader to look into attending the next Arizona Workshop in Normative Ethics. This is not a book for the layman, however. If one is not a specialist, it will take work to wade through the subject-specific language and myriad of referenced, but not expanded on, ethical theories. Overall, the vibrant and diverse developments in normative ethics should be broadcasted, and Oxford Studies in Normative Ethics acts as the loudspeaker. Asha Lancaster-Thomas is a philosophy PhD student at the University of Birmingham.